This comes from http://www.mindsetsonline.co.uk (formerly MUTR) where they have a kit (or parts that may get you started). Their info sheet gives a great over view. Got around to making a mould for a wheel and giving it a go... some success but a little more work to do. 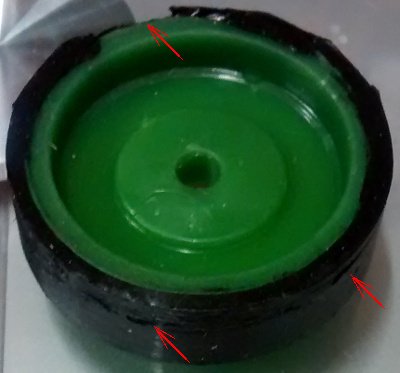 This was the latest image for the glue gun moulded wheel wheel, this one has the tyre moulded to the rim. There's a couple of defects, partly due to thickness of the tyre making it difficult to pour into the mould... it was an open top mould at this stage, close mould and injection may have been an alternative but I'm likely to open the diameter for easier pour. How many squeezes of the trigger does it take to mould the wheel? In some of your moulding there seems to be some sign of flow patterns. Are these where the front edge of the hot plastic momentarily halted in between squeezes? It might be worth pulling a glue gun apart to get the hot extruder and then fit this onto a screw press so you can maintain a constant pressure on the glue stick. I don't recall how many but it was 1/2 a glue stick worth of squeezing. The cooling makes it impossible for the low flow guns and I needed to increase the cross section to allow this to flow enough to work without back flow through the gun. Working a hot mould can allow for thinner sections and fewer flow signs but it's more difficult to handle overall. The strip-down might be an idea but I've seen alternative methods with aluminium blocks heated by soldering iron inserts. The application used recycled plastic milk bottles and used either a press drill or a custom frame to apply the injection pressure.